A. Like so many others, I first learned stitching at home under my mother's direction. She was a home sewer, embroiderer and quilter. As her oldest daughter, I was inquisitive about learning anything that had to do with thread or fabrics. I sewed for my children when they were small. By the time my youngest was was in school full time, I decided it was time to learn some other things and came upon rug hooking. 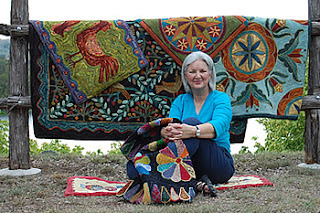 There are a lot of rug hookers who enjoy needle punching and I was able to find out the basics as well as see demonstrations at rug hooking events. 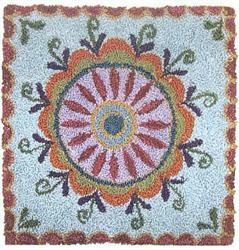 My first original pattern was designed just a few days after learning while on a trip with friends and was the first in a series of four floral designs that were also converted to rug hooking patterns. Q. When did you begin designing your own patterns and how did that turn into a business? A. I have been designing rug hooking patterns since 2001 and in 2008 I launched my website named Hill Country Rug Works. When I designed my needle punch patterns, they became a part of my offerings for online customers. Q. What are a few of my favorite themes when designing a pattern? A. Over the years I find myself vacillating between two types of designs: repeat pattern or geometrics and fantasy botanicals. The color possibilities in each of these themes is boundless and gives the stitcher (myself included!) optimal expression in the use of color. A. Once a needle punch design is completed, I am compelled to work it out in color. It is the part that I love to do and look forward to seeing it brought to life with my extensive collection of threads. Q. Do you feel your style has changed over time, and if so how do you feel about your older designs now? A. I do feel that there are shifts that have occurred over time. I started out years ago with imitating a more primitive style but felt that I would just be adding to more that was already out there. I wanted to have something that was uniquely my style. I committed to sketching and doodling with the promise to refrain from self criticism. Six months to a year thereafter I was beginning to recognize characteristics that eventually marked my style of undulating florals fitting closely within the format like puzzle pieces. My feelings about these stylized designs from a few years ago are much like being with old friends: We know each other well and look back on our history with fondness, loyalty, and deep appreciation. A. This year I learned how to spin fiber. I am also learning to weave. I am looking forward to using all the yarn that I have spun and weaving some great rugs and garments. Q. What is your favorite holiday and why? A. I love New Years Day. After all the busyness of the Christmas holiday, I find it particularly relaxing to not make any special plans for New Year's Eve or Day and just enjoy what family happens to be around. I find it is a contemplative time and a time filled with hope and anticipation of all they days to come in the New Year. A. I listen to Pandora radio a lot, especially while I am working in my studio. There is a station called "Ambient" radio that is particularly calming. The music is very ethereal and takes my mind to a very calming place that is conducive to being creative. A. I have a wonderful supportive husband with a great sense of esthetics. I rely on him repeatedly to to qualm the doubts that arise in my creative ventures. We have four children, a son (oldest) and three daughters, and one grandchild. It is a busy house I live in as they weave in and out of our lives on a weekly, sometimes daily basis. They all have wonderfully creative interests that they exercise from time to time as their careers and families allow. Q. What is your greatest strength? What is your biggest weakness? A. I have to chuckle at this because the answer is the same for both questions: single mindedness. It works as a strength because when set to the task at hand I am focused almost to the point of being immovable. I can get things done that way. Then on the other hand, it is a weakness because life doesn't always allow for days without interruption, hence frustration. With age, I have learned not to be so production minded, but oh to have to forgo the pleasure and gratification of a task completed . . . well, my patience is growing, however incremental! A. I first started stitching, at least seriously about 8 years ago after I went into my LNS looking for something to do. I saw a model of the Cross‘n Patch Christmas Star hanging on their wall and said, “I have to learn how to do that!” I had never even heard of Hardanger before, but fell madly in love with it at first site. I took a beginners class where I found Hardanger to be more addicting and much easier then I expected and was instantly hooked. A. Since Hardanger is my first love I tend to lean towards designers like Victoria Sampler, Judy Dixon, Cindy Valentine, Satin Stitches and Colette Robinson. Whereas most of my customers do not do Hardanger the charts that sell well are a different mix of designers. I do not want to leave any great designers off so I will not list them individually but I will say that samplers and smalls are very successful. Q. Do you have any advice for any aspiring shop owners out there? A. Be prepared to treat it as a business and not as a hobby. While you might enjoy stitching as a hobby to pass the time or relax with, running a business should not be treated the same. In fact there are many times that I get so caught up running the store that I don’t realize it has been months since I picked up a needle and thread for personal reasons. You also need to be able to look at products using your brain instead of your heart. In other words be able to step back and make a decision based off of what makes the most business sense that is not necessarily the same conclusion you might get going off of your personal preferences. And while the thought of purchasing all the latest and greatest patterns, linen, etc might excite you this is actually a small percent of running a business on a day to day basis. Are you ready to deal with the other functions of a business? If so, it is a great way to make a living. A. Christmas is my favorite holiday, probably because it is more of a season to me then just one day. It is a time to celebrate and be with family and friends, a time to build memories with kids and celebrate traditions from past generations. It also doesn’t hurt that I have a real soft spot for snowman. A. I have a wonderful husband and have been married for 13 years. We have two incredible kids, McKayla, our sweetie, who just turned 11 and is a creative inspiration. She already has a wonderful sense of colors and has recently become very interested in fashion design. We also have a son Trey who is 6 and is our little buddy. He is always making us laugh and we are always amazed how his mind works, the questions he asks and how he solves problems. Trey is has a lot of food allergies (Peanuts, Tree Nuts and Eggs) so dealing with that on a day to day basis has been a real eye opener and so we are also very involved in the Food Allergy community and are local walk chairs for the national Food Allergy Walk. We also have two dogs, Molly who is a 3 year old cockapoo and a 3 month old labradoodle named Jazzy. A. I would have to say my family is my biggest source of inspiration. My husband is my strength and really grounds me and keeps my head together and is a great source of knowledge and laughter. McKayla has made me so proud on the things she has overcome in her life and is a very creative person and has a huge future ahead of her. Trey is an amazing little kid who takes the trials he has been given in stride and brings laughter to everything he does and everyone that is around him.